Vanessa Parellada, Jordi Vidal and Mónica Rey sat down today to announce details about the programme of events for Universal Children's Day. The island's secretaries of social welfare and sports and the Office of Youth Services' staff specialist gave a sense of what to expect on 20 November. For the past two years, the day has entailed a range of activities for children and teens on the island. It bears remembering that Formentera has been designated a Child Friendly City since 2014. First up, on Saturday, the Council will invite years five and six of the island's primary schools and local highschoolers to watch SD Formentera and RCD Mallorca face off from a youth area set up in the stands of the municipal football pitch. Secretary Vidal reminded residents that admission to the match will be free for youth under 12 and encouraged them to come out for the event. The sports don't stop there. Sunday, November 5, a family sports day will be put on at the Antoni Blanc fitness centre so residents can learn about the centre's programme and facilities. Then, the municipal pitch will host another round of sports days, this time during school hours, and November 27 an aerial acrobatics show will be staged from 4.00pm to 6.00pm at the sports facilities of Marc Ferrer secondary school (Poliesportiu Vell). 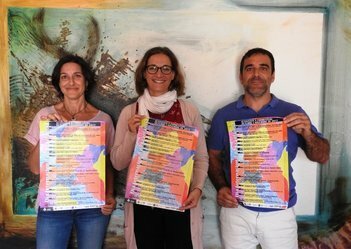 On November 20, representatives of Formentera's youth participatory council, or CPIJF, will take part in a session of parliament designed for children and titled “What kind of world do we want to live in? Looking at the Agenda 2030”. The day's session is presented by UNICEF with additional support from the Balearic Islands' office for the defence of the rights of minors. Then, November 29, the CPIJF will hold its own plenary session. The first stage production will take place October 30. The Camut Band's “Big Drums” is for the student body of Marc Ferrer high school. Another theatre group, Xoc, will arrive on November 17 ready to present Formentera crowds with two shows: “Improaventures” will unfold in the Marià Villangómez library at 6.00pm and “Improxoc” in the Casal de Joves at 7.30pm. November 24 will be marked by a stage production dubbed “El molinet màgic” (The magic mill) in Formentera's cinema. The very next day at 6.00pm, cinema audiences can see Engruna Teatre's “Codi Postal 00,” part of the island's ninth festival of children's theatre. Two talks for parents and teachers have also been included on the Universal Children's Day programme. The first, Una altra forma de relacionar-nos és possible (“Another way of communicating is possible”), will be led by Elena Sorribes from el Sol free school at 7.00pm in the Casal de Joves. The second is called Ciberassetjament (“Cyberbullying”), and will be given by IB Jove's Ajo Monzó at the same time and place. Then, from 5.00pm to 7.00pm on November 9, a gymkhana has been organised to educate Formentera residents about issues facing minors with disabilities. More gymkhanas, including sports activities and fitness drills, are also scheduled for 5.00pm on November 16, 23 and 30. The activities will play out in the courtyard of Sant Ferran's primary school with the help of Formentera's youth counsellors. Saturday, November 11 at 6.00pm, Íker Reyes will lead a cooking workshop in the Casal de Joves. On November 25, youngsters of the island are invited to come out for a bike ride aimed at promoting healthy habits. Register in advance at the Casal de Joves. All November long, children of the island will have an opportunity to engage with patients of Formentera's elderly care centre in an intergenerational space.